The Athenaeum on Beacon Hill is Boston's premier "private library," but also an important museum and gallery worth a visit. The Boston Athenaeum, tucked away atop Beacon Hill just off Boston Common and a few steps from the Massachusetts State House (map), is a grand old Boston institution, and well worth a visit for its art exhibits. You can visit the Athenaeum to view the current historical or artistic exhibition, or call (tel 617-227-0270 x221) and reserve a place on a free guided tour (Tuesdays & Thursdays at 3 pm) of the art and architecture of this National Landmark building. The Athenaeum was founded in 1807, at a time when books were valuable and good collections of books more valuable than the sum of their parts. Private libraries were the norm, but collective private libraries—in which several people or families of wealth combined their respective collections, or sums of money to purchase books, for the good of all contributors—were gaining in popularity. Such collections were then owned jointly by the contributors. The Athenaeum is still a private library owned by such a collective: 1049 Proprietors, who can pass right of ownership in the collection by heredity. The Athenaeum encourages new members to join. Members receive invitations to many events (lectures, concerts, book talks, children’s events, etc. ), and can check out books, participate in discussion groups, and use the library as a quiet place to write, read, and think (with WiFi). It’s a wonderful place to write, conduct research, and keep the mind active. 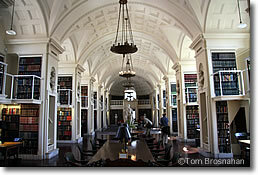 The Athenaeum's collections of books are strong in the history and literature of Boston and New England, and are used frequently by serious researchers. The Athenaeum's Neoclassical 19th-century reading rooms are used by members, their guests, and other approved researchers. The nearest subway station is Park Street. 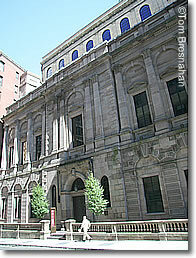 Above, the Boston Atheneum's Neoclassical façade. Below, the 5th-floor Reading Room.